Colorado does not have purchase permits, gun registration, or gun-owner licensing. There is no waiting period mandated for firearm purchases, but private gun sales are illegal. Concealed handgun permits are shall-issue and loaded open carry is allowed (with some exceptions). Colorado is a universal background check state. Magazines over 15 rounds capacity ('high capacity') are regulated. Denver has regulations which are more strict than the rest of the state, including banning 'assault weapons'. 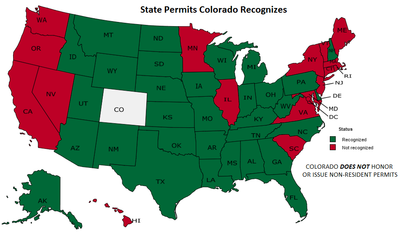 National Forest or Bureau of Land Management (BLM) lands in Colorado have no ban on the carry of firearms. Firearm carry on Indian reservations is a gray area. Some reservations do permit concealed carry with a valid concealed firearm permit, however, it may vary. Tribes cannot enforce tribal law on non-tribal members, though they can enforce state and federal law. You may be trespassed from the reservation and have your firearm confiscated. One should contact individual reservation authorities for clarification of their regulations. Denver is a special case. The following special exemptions apply and locals laws may be more restrictive than above. ​'Assault weapons' (including the modern sporting rifle and shotguns with more than six shells capacity) and magazines exceeding 21 rounds in capacity are banned (state law is 15). This does not apply to grandfathered guns with a permit or to non-residents traveling through Denver. Open carry within Denver limits is illegal. Denver has banned open carry since 1973, under the premise that Denver is 'special' and somehow different than the rest of the state. Arguments seemed to be based on the fallacy that an openly carried handgun equates target shooting and that allowing open carry in the city would lead to people getting shot. 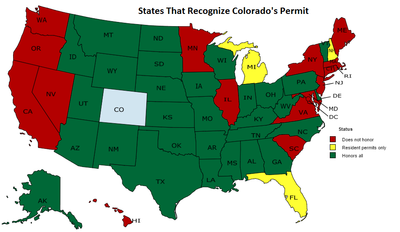 The Supreme Court found that Denver has the right to regulate open carry because it is urbanized. When it comes to assault weapons the judge literally found that 'Denver is special' and upheld the laws. " Like open carry, there is little need for statewide uniformity given the unique characteristics of Denver, and the impact of the ordinances on people living outside of Denver is minimal." In other words, Denver residents are less entitled to full Second Amendment rights than other Colorado residents. Notwithstanding any other provision of law, no municipality, county, or city and county shall have the authority to enact or enforce any ordinance or resolution that would restrict a person's ability to travel with a weapon in a private automobile or other private means of conveyance for hunting or for lawful protection of a person's or another's person or property while traveling into, through, or within, a municipal, county, or city and county jurisdiction, regardless of the number of times the person stops in a jurisdiction. At a residence for self-defense with permission of their parent or guardian. No person may intentionally, knowingly, or recklessly provide a handgun to a minor under 18 (juvenile). Anyone who knows of a juvenile in illegal possession of a handgun (18-12-108.5 above) must make reasonable efforts to stop the minor or take the handgun away. No person shall sell, rent, or transfer ownership or allow unsupervised possession of a firearm by any juvenile without the consent of the juvenile's parent or legal guardian. All citations Colorado Revised Statutes (CRS) unless otherwise indicated.